Lately I’ve been wondering what to do in the mornings with my one year old while her brother is at playgroup. She’s dropped her nap and suddenly I’m back in the stage where I’m in desperate need of some activities for toddlers! I can’t sit around the whole time playing with toys so I thought it would be fun to do some kind of craft. Obviously at one it’s all about the experience rather than the finished product but I wanted it to look like ‘something’ if you know what I mean! Sea crafts for kids are perfect for stuff like this as there is no right place to put things and everything is the right way up underwater. 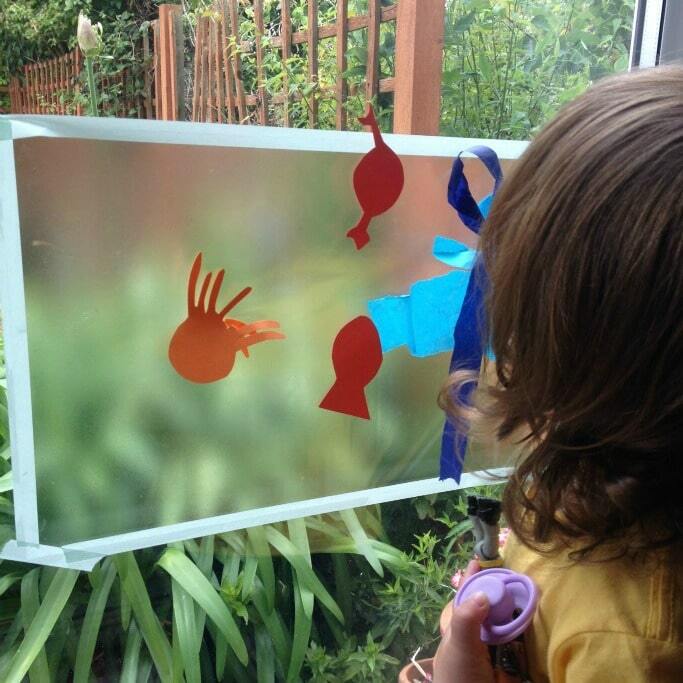 This ocean themed toddler art kept her entertained for ages and it kept me busy too! I washi taped some contact paper (sticky backed plastic) onto the doors in my room at about my daughters height. You could use sellotape but I find that washi tape is much easier to remove and less likely to leave any marks behind. 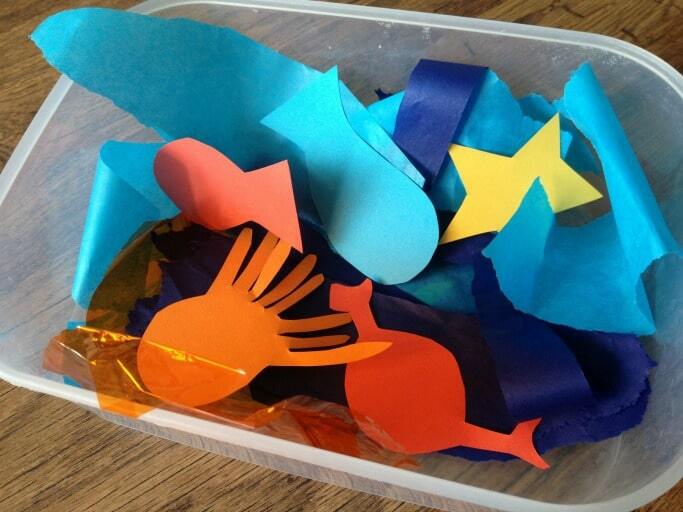 Then I cut out some ocean themed shapes from some coloured card for her, fish, a crab, jellyfish and a starfish. If you are good at pre planning stuff you could use different textured materials for these, bubble wrap would work nicely or some tin foil. I popped all the shapes in a box along with some blue tissue paper for the sea and a bit of cellophane which umm… didn’t really fit the ocean theme but it has a nice feel and noise to it and I thought maybe it could be some coral or something? I’m pretty sure she would be cool with that (Nb. She totally wasn’t cool with that, it’s the only thing she refused to use, she obviously knew it didn’t really fit her art). I then gave her the box and showed her to the sticky window and let her get on with it! She totally loved this activity and I could see that she was really concentrating deciding where things should go, playing with the tissue paper and trying to move the fish when she wasn’t happy with their location. For something created by a 21 month old I think it looks pretty cool too! 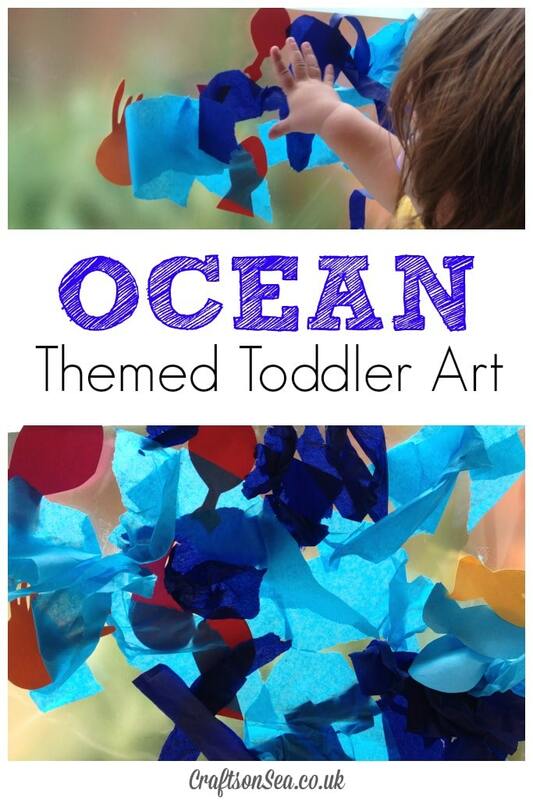 If you want to keep your fabulous ocean themed toddler art, all you need to do is pop another piece of contact paper on the back so that all the paper is sealed in the middle!